Imagine the unbelievable power of a group of people who do more than just like or plus one your content? Now envision an enthusiastic crowd that seeks out your content and eagerly shares it with their network. That’s what an engaged social media following plus powerful, attention-grabbing graphics can do. Not only can they build brand awareness, but also online influence as you cast your marketing net across a larger audience. The great news? Adding eye-popping images to your unique content has never been easier! Whether you’re creating images for Facebook, Google+ or Pinterest, getting inside your fan or followers head is critical. Before you begin the design process, know whom you’re creating a graphic for. Is it buyers, sellers or are you using social media for recruiting purposes? Whatever the case, tailor your graphics to meet the needs of your particular market. And don’t just create an image of your latest listing. Have fun and share topics that are relevant to your audience, no matter where in the home buying/selling process they fall. Not sure what to share? Each idea below will help you craft a compelling graphic. Successful real estate professionals know that a potent online lead generation strategy paves the way to increased conversions. If you want to increase the eyeballs on your content and improve the chance that you’ll win the sale or listing, the right graphic is key. Leverage the power of your brand along with the influence and identity they’ve already established. Create graphics that are similar in look and feel, drawing a connection between you and your brokerage. This will construct a visual correlation, making your content easily recognizable and therefore, more trusted. It will also allow establish you as the expert or authority on everything real estate-related within your local market, driving additional traffic to your social media channels, website and blog. As buyer’s appetite for web content continues to grow, providing an easy way to access your listings is important. 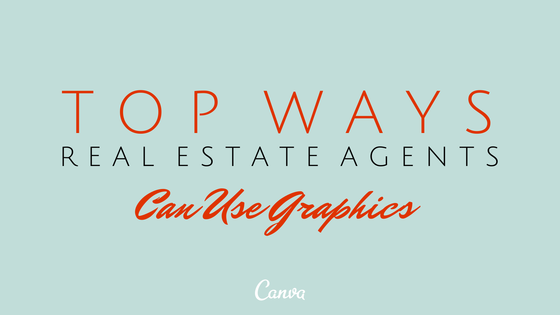 Use graphics to create a visually appealing announcement for each of your listings. Not only will this keep you top of mind, but begin to establish you as a reputable and experienced local professional. As a real estate professional, your goal is to make the buying process as easy as possible. Share your experience; know-how and expertise to ensure buyers have all the resources they need to make the right purchase decision. What are buyer’s biggest challenges within your market? Now share weekly tips designed to make their experience more enjoyable. What are the top questions from previous buyers? Now answer those questions through quick visual tips. What local events are happening that your audience would be interested in? Share a graphic relaying that information. What are the special needs of pet owners? Share advice on how to prepare pets for a move. As you can see, the list can go on and on! There are many ways to establish influence online, but none as effective as consistently sharing your own thoughts, views and valuable insight. Whether it’s information on how to effectively navigate the home buying process or how to move without breaking the bank, graphics can help get your point across in a quick and efficient manner. The idea is to become known as the go-to authority within your local market. Remember: your local community is looking for information online. Make sure you’re the one consistently sharing it with them through a vibrant visual online presence!